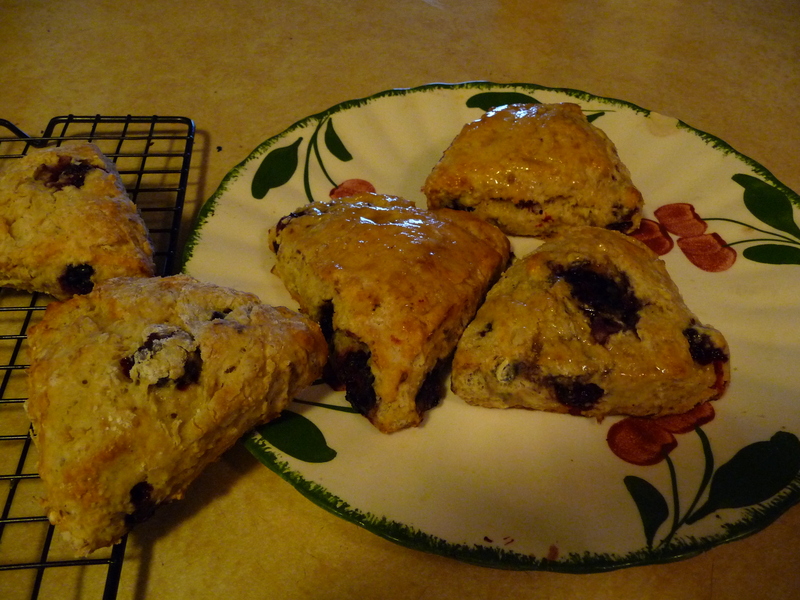 I made some some scones with blackberries the other day to serve with afternoon tea. Yum. They were so easy to make and tasty. And that got me thinking about how I came by this recipe. About 15 or 16 years ago, my sister Milly gave me a calendar from Mollie Katzen’s “Still Life with Menu” book. It had Katzen’s charming paintings and a recipe for yogurt scones which I came to love so much that the calendar was always turned to the same page. These pastries could be put together quickly, forming a wet dough that you sort-of plopped onto the baking sheet and brushed or patted with egg. They called for yogurt instead of the more traditional (i.e. fattening) cream. And they were delectable. At first, the only change to the recipe I deemed necessary was to add (of course) grated lemon zest. I never wrote the recipe down, because I just kept the calendar open to the scone page on top of the fridge, handy whenever I needed it, for the next couple of years. Then it came time to move. This was about 13 years ago. I was packing up my things–but when I went to look for the calendar, it had mysteriously disappeared! I even plunged into the scary no-man’s land behind the fridge, braving cobwebs and crumbs, but there was no sign of the beloved scone recipe. I suppose I could have bought Katzen’s book or, being cheap, checked it out from the library. Or even surreptitiously written down the recipe in a bookstore. But instead I just tried to reconstruct it. That was pretty successful. Then I started changing it. And changing it. At this point, I think it could be justifiably called my own recipe, or nearly so, gratefully inspired by Mollie Katzen. The dough I use is not as wet, so you can pat it into a circle and cut it into the traditional triangular shapes. Also, I always make these scones with berries, frozen berries–no need to thaw them– a tip that came from Nia (which she got from someone else). Steve and I picked enough blackberries this summer that I still have a couple bags in the freezer, but store-bought blueberries or raspberries will do just fine too. I also often use whole wheat pastry flour, which works just fine. And nowadays, on the cholesterol watch, I substitute olive oil for half of the butter (the lower amount called for) and egg whites instead of whole eggs. These scones have adapted well and are still delicious! 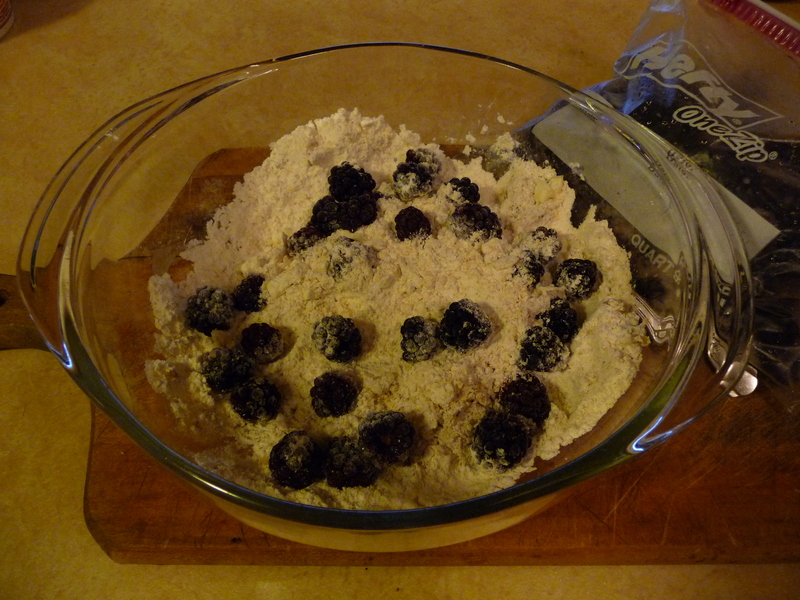 Mix the dry ingredients (flour, baking soda, baking powder, salt and brown sugar) in a large bowl. Cut in the butter (or, if you’ve planned ahead and frozen the butter, you can grate it into the dry ingredients), using a pastry cutter, two knives or your fingers (working quickly). In a small bowl or 2-cup measuring cup, beat the egg or egg whites together with the yogurt. Pour the yogurt mixture into the flour mixture, and mix with a fork only until the two mixtures are distributed and the dough holds together. Do not overmix. 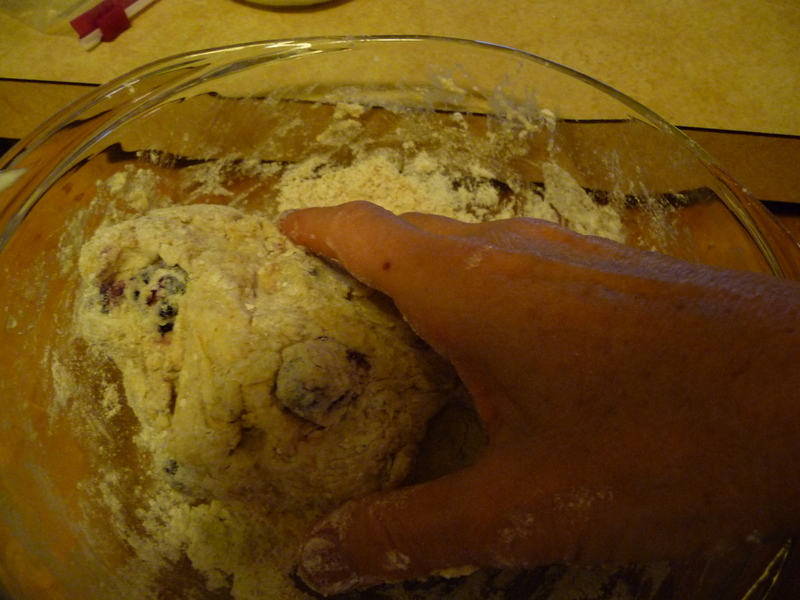 Finish patting the dough together with your hands, and stir in a little more flour if needed. The dough should be very moist, but not sticky. Divide the dough in half and pat each half into a thick circle about the size of a small dinner plate. Bake for 12 to 15 minutes until golden. To glaze the scones, mix up some confectioners sugar with a little liquid, such as lemon juice or maple syrup, and brush it on the scones while they are still warm.